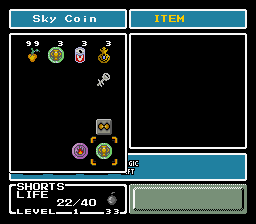 Basically, instead of checking for event flags to control a good chunk of the events in the game, it's run by key items out of the inventory--most notably the coins. 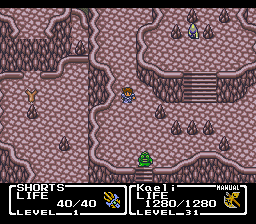 The coins are the only things that really gate your progress, since it controls your pathing through Focus Tower, and once you get the first level of claw there's only one type of tool-blocked terrain left (which is a weapon upgrade you get in the Wind Crystal chunk). So they never implemented safe guards against people sequence breaking, because they assumed that inventory control would handle their problems for them. And then they screwed up the inventory handling. You, uh... and the fire cryst- oh. Oh. Okay then. Not to put you on the spot here, but what did it look like to you? 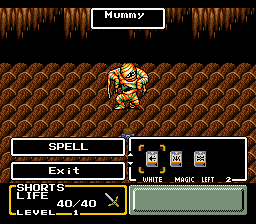 I think alternate interpretations of sprite art are really interesting. 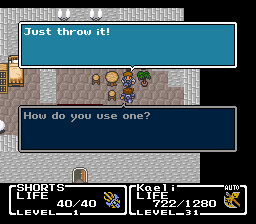 I usually thought it was something like the "but you're still hungry" machine in Chrono Trigger, even though that never made complete sense to me. Occasionally it looked like some sort of placard with an abstract design on it, but that made even less sense. This was already good and it's gettin' good-er. So anyway, why "Poison Flour?" Great question! 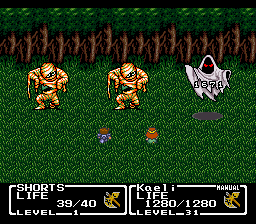 The typical name for such an attack in video games is "毒の粉," pronounced "Doku no kona." It's the same spelling for the Pokemon move that in the West is called "Poison Powder." "粉," the word that can mean "dust," or "powder," can also mean "flour." 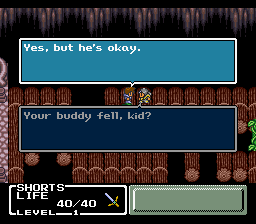 Even though FFMQ was designed for a Western audience, it was still designed by Japanese folks and probably had to go through a localization process. So somewhere down that line, someone had to make a call, and it was the wrong one. Or, well, it was a slightly wrong one. 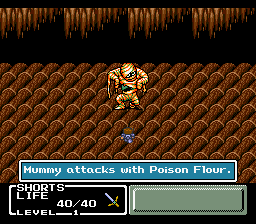 It is fun to imagine those mummies shuffling off a cloud of deadly baking flour. Meanwhile Dracula here's a completely unassuming cake I baked for you! 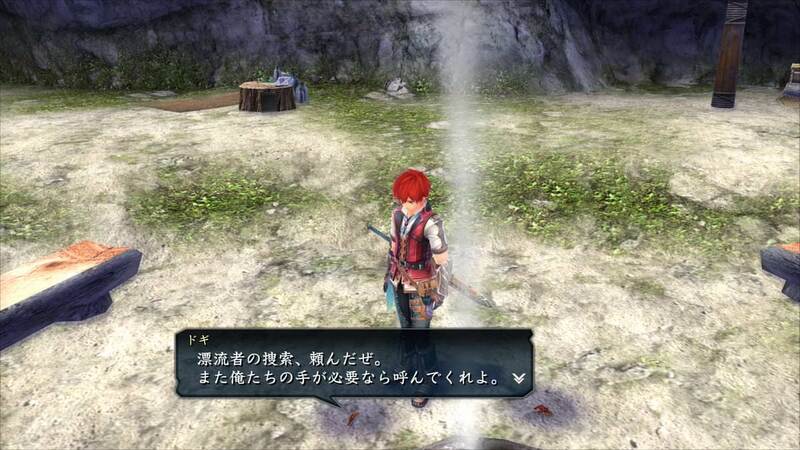 I wonder if it has anything in common with the "poison mist" from Japanese pro wrestling. OK, so this last chapter was a real ride. You're wondering what happened. You're not alone. I, too, was burning with curiosity about how exactly this trick works, so I did Research, and I present to you now the fruits of my labors. To prepare for this trick, we need a specific arrangement of consumables. We need some Cure Potions, Heal Potions, and Refreshers -- it doesn't matter how much of each, so long as we have at least one -- and the slot before the Cure Potions must be empty. This isn't too hard to set up as long as you know where to acquire some of everything. After that, we talk to the Seed salesman. 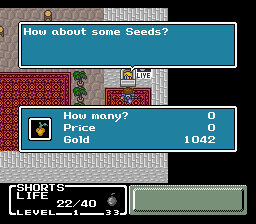 As mentioned, the first opportunity to buy Seeds is in Fireburg, which is why this trick isn't available earlier. Consumables salesmen allow you to buy any amount that you can afford, which includes zero. If we were to buy zero of an item that we already have, nothing would happen, which is why we need to have no Seeds before the purchase. Aside from Refreshers, you can use consumables outside of combat even when they would have no effect, so that part's not hard to set up. Once we buy zero Seeds, we have zero Seeds in inventory. Why? To answer that, let's look in the game's memory. This it what the memory looks like before we buy zero Seeds. 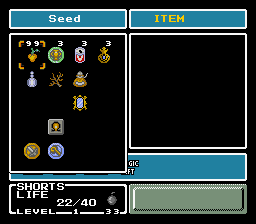 Item #10 is Cure Potion, #11 is Heal Potion, and #13 is Refresher. All of these numbers are hexadecimal, so instead of the digits going from 0 to 9, they go from 0 to F. You don't need to understand hexadecimal to follow along, but keep that in mind for later. Each of our inventory slots has two numbers associated with it. The first is the ID -- which item is this? -- and the second is the quantity -- how many do we own? How many Seeds do we own? Actually zero, but since the game sees that the first item slot contains zero Seeds instead of zero nothing, it's happy enough to allow us to use one. What happens when you use an item? Why, the quantity goes down by one, of course. What's zero minus one? Okay, let's see what the memory has to say about this. That's FF in hexadecimal, or 255 in our normal numbering scheme. But we subtract by carrying the one from somewhere, and in this case, the one came from the item 2 ID slot. The computer kept going until it found a digit it could subtract from. Why do we care that it's no longer a Cure Potion? Well, recall what happens when you buy an item that you don't already own: the game finds the first empty item slot and sets it to that item. But all four of our item slots are full. What's to the right of those four slots in the game's memory, anyway? In other words, it fully expects to find an empty slot in one of our four inventory slots, because that's how the game is meant to work, but if it doesn't, then the value of "slot" after leaving the loop is one more than it should possibly be. Whatever the case, we have the ability to overwrite those inventory slots with the item ID and quantity that we choose. 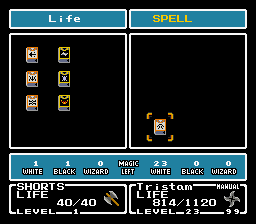 Those eight items are, in order, Elixir, Tree Wither, Wakewater, Venus Key, Multi-Key, Mask, Magic Mirror, and Thunder Rock. We have the first, second, third, and seventh of those. The second slot works the same way, but for the items Captain Cap, Libra Crest, Gemini Crest, Mobius Crest, Sand Coin, River Coin, Sun Coin, and Sky Coin. After buying 19 Cure Potions, our inventory looks like this. Let's take another look at the memory. So now that we know how the trick works, why don't we use it to get anything else? And why wait until Fireburg when we could do the trick with Cure Potion vendors? Let's answer the first question first. What else could we get with this trick? In our first two rows, we could get the values 10, 11, 12, or 13, corresponding to Cure Potions, Heal Potions, Seeds, and Refreshers, respectively. That could potentially get us the Thunder Rock and Magic Mirror in addition to the Venus Key. 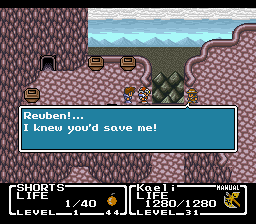 The Magic Mirror is no longer useful by Fireburg, but Thunder Rock is a necessary plot item later. In the bottom rows, we could get any of those items except for the Captain Cap -- our limiting factor is that we can only buy 99 of an item. 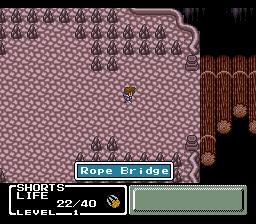 The River Coin and Sand Coin are no longer useful by the time we get to Fireburg, and the Mobius Crest is the only one we really need from here on. While we could have gotten more here, we also need enough money to buy the Cure Potions. This glitch is used for speedrunning FFMQ, and for the purposes of the speed run, it's fastest to play normally until Fireburg. 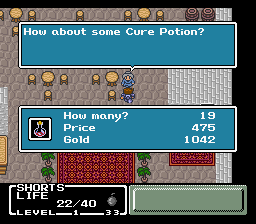 Purchasing the Seeds and Cure Potions is extremely quick and allows us to bypass an enormous chunk of the game. For non-speedrunning purposes, we can probably do a lot more; I hadn't really looked into how exactly the glitch works until I went to do this writeup. 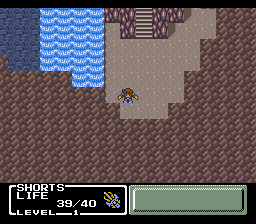 We haven't seen the last of this glitch, and after SHORTS's adventure has concluded, we'll revisit what exactly we can do with this. Just how badly can this game be broken? I'd kind of just assumed that the locations of consumable items were hard-coded. From a game design standpoint it's generally a better idea to do floating pointers; if you hardcode your inventory locations, what happens when your game designers decide to expand or contract (remember, console memory is at a premium) the inventory size/range of items after you've put the code together? Doing it dynamically mostly sidesteps that problem, though you do have to put in checks to guard against these kinds of shenanigans. You can't buy zero of an item. Acquiring zero of an item doesn't assign that item an inventory slot. Zero quantity is treated as an empty slot. You can't use an item with zero quantity. Using an item with zero quantity doesn't decrement the quantity. Decrementing a zero-quantity item doesn't spill over the subtraction. When all inventory slots have other items, you aren't allowed to gain a new kind of item. That looks like a big list of mistakes to make, but most of them are reasonable inside of the assumption that there are only four kinds of consumable and no way to underflow. Nowadays, this kind of bug can't possibly happen. Modern programming languages prevent this sort of spillover. That doesn't come without some additional overhead, but today's machines are also way more powerful than they were 25 years ago. Not too many people code things in Assembly anymore, no. True. I will never forget how hard I laughed in skyrim when my ice spell sent a bear into space. 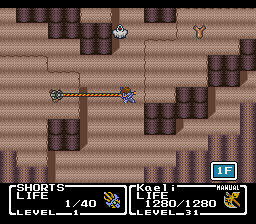 The Steam version of Ys 8 has a bug where Dogi turns into a crab. 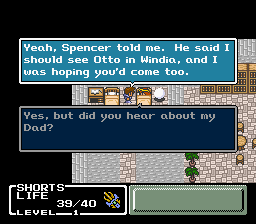 Mystic Quest, huh? I have to admit, I've never been much of a fan of this game, but it sure is fun to see it broken wide open like this. STORY TIME: When I was 12 or 13, I went to New York for the first time with my parents. 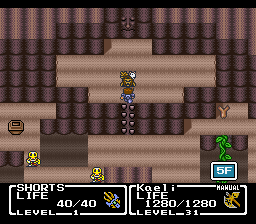 I believe it was on the ground floor of the Empire State Building that I found a Toys'R'Us (rest in power) that had copies of this game and FF II (IV). 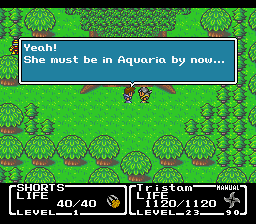 I had already rented FF II and played about 2/3 of it, so I decided to go with Mystic Quest...but I wound up regretting my decision. This game isn't necessarily too easy or simplistic, but for all the cute enemy drawings I found it very dull from a presentation standpoint. 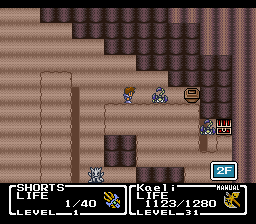 After the bouncing and popping spell effects of FF II, combat seemed really dull and ugly in this game. 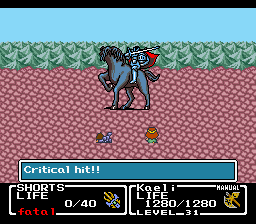 There's also the fact that damage is super predictable in MQ: if you don't land a critical, then every attack to a given enemy will do the exact same damage until your stats change. 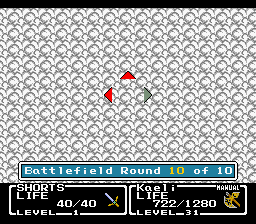 In practice, that doesn't make much of a difference to how the game is played, but it really drove home how repetitive the random encounters were when you could predict exactly how many hits each enemy was going to take for an entire dungeon. 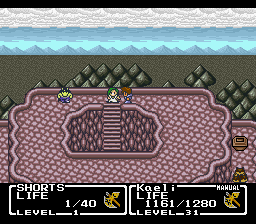 In the end, I didn't hate the game, but it seemed shallow and boring compared to FF II. It's possible that I was slightly too old for MQ by the time I got to it, too. Anyway, you're doing great work here, Mogri. Let's see what else you can break! 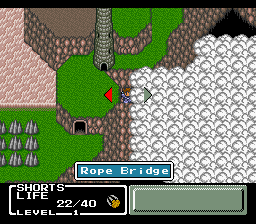 That does make me wonder what is the last game released to have an under / over flow bug like this. C is only a step above assembly so I think it's still possible for errors like this to occur in games coded with that. Amazing and educational. And I'm curious about what else you plan to achieve using this trick. 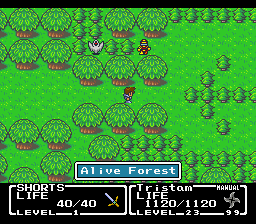 The Alive Forest is an odd name for an area swarming with undead. 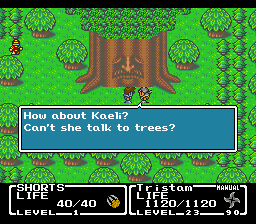 This is also the point at which the level designer got bored and inserted dumb messages with the trees (and not for the last time). 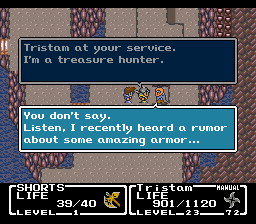 Tristam has leveled up since we last met, but that's about the extent of his improvements. He's not with us long, though. Like, not long at all. But as long as he's here, let's grab this. 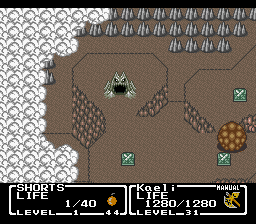 The Giant's Axe is the third and final axe. The second is available for sale in Fireburg, but there's no reason to buy it when the Giant's Axe becomes available basically immediately after. 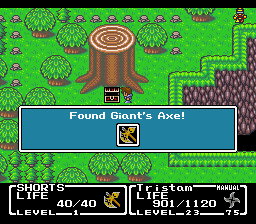 At the moment, the Giant's Axe is actually a bit more powerful than the Jumbo Bomb, even with our pathetic stats, and more enemies are weak to it. 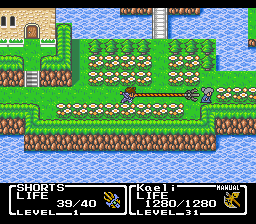 But the Giant's Axe is the weakest top-tier weapon, and it confers no stat bonuses. 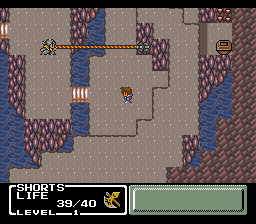 It's a nice weapon upgrade for now, but Exit is a more reliable method of dealing with anything that's not a boss. We also pop back into Doom Castle to pick up the chest we couldn't get before. This is a very curious enemy group. 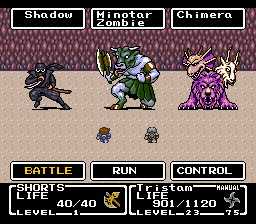 The Minotaur Zombie was a regular encounter in Bone Dungeon (and yes, it's exactly the same monster), and the Chimera is a palette swap of a boss we haven't fought yet. 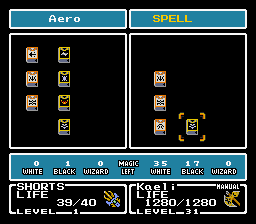 Anyway, Aero is the last and most powerful Black magic spell, nearly as powerful as the other three combined. Hardly anything resists wind, but there's also not a lot that's weak to it, although a few upcoming bosses are included in that number. 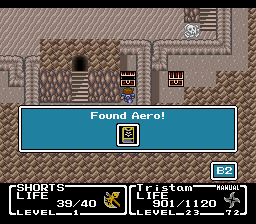 Against those bosses, Aero might actually be SHORTS's best attack. Kaeli is sleeping in Phoebe's house. 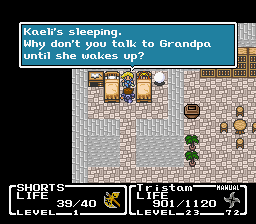 At this point, Kaeli has spent most of the game in bed. 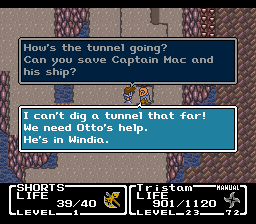 We missed this plot point somewhere along the way, but Spencer (who is Phoebe's grandfather) is digging this enormous tunnel not because he's insane (though let's not rule that out) but because he's trying to save Captain Mac, whose ship was stranded in a very improbable manner. Spencer notices Tristam, and the two hit it off, resulting in the pair leaving together on a much more lucrative adventure. Did you almost forget, too? 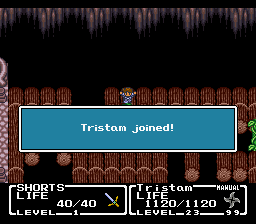 The awesome-looking weapon that Tristam pulled from our adventure in Bone Dungeon is ours now. I guess it wasn't his style. The Dragon Claw is the third-tier claw; we never saw the area that holds the second. It's weaker than the Giant's Axe, but not vastly weaker. Like the Cat Claw, we get +5 Magic while we hold it; also like the Cat Claw, we want it because of the status effects, comprising almost every last one in the game. The full set is Petrify, Paralyze, Sleep, Confusion, Poison, Blind, and Silence. There's something there to love against most enemies, but the most attractive of those is clearly Petrify. 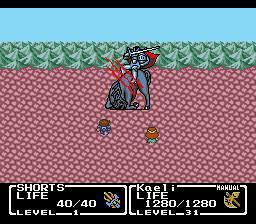 The game doesn't have a special animation for it, so anything we hit that's vulnerable will appear to simply die in one hit. It's also just really fun to play with. 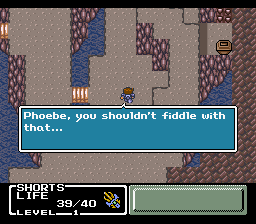 Phoebe then decides to take the tunnel into her own hands, with disastrous results. Captain Mac is Kaeli's dad. We missed that somewhere along the line. It's not especially clear what Captain Mac has to do with the crystals, but then there's a good chance Spencer would've cleared that up for us if we'd bothered visiting Spencer the first time around. 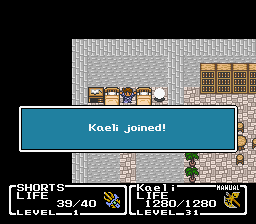 Kaeli has gotten a significant overhaul since the beginning of the game. 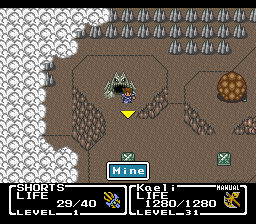 She now wields her own Giant's Axe, which might be the most disappointing of the top-tier weapons, but it's still a very contemporary weapon and one that's particularly well-suited for the dungeon we're about to face. 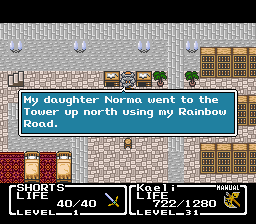 Besides that, she now has Cure and Heal in addition to Life, and she has her own copy of Aero -- and actual stats to back it up. Not bad. Kaeli casts Aero on a lone target that's weak to it, dealing 1671 damage. This is our first attack to break four digits. This is highly acceptable. 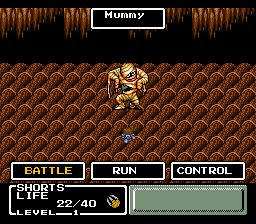 Not to be too far outdone, SHORTS lands a critical hit with his Giant's Axe, killing a Mummy in one hit. Pretty impressive, little guy! 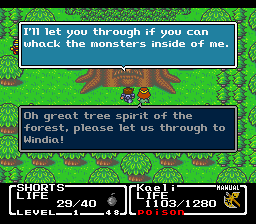 Giant Tree is our next dungeon. 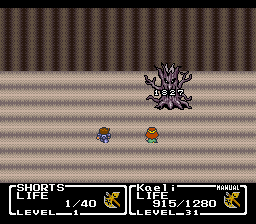 It's got a lot of the undead we were fighting as well as smaller trees (???) and worms (makes sense). Of course, our true objective is not to whack everything in here. Our real goal is the boss at the end. On the higher level, you can see some Angry Birds slingshots that serve as grappling points for the Dragon Claw. 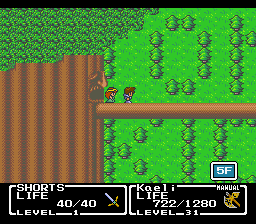 SHORTS reaches a new high here, landing a critical hit against a tree that's weak to the Giant's Axe. It's not unreasonable that this could be the most damage he does in a single attack in the entire game. Hookshots are never not great. Are you making a game? Put a hookshot in it. On the second floor is this chest we aren't going to get. 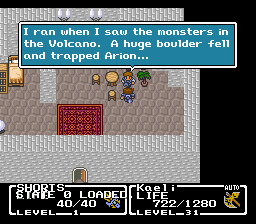 That's partly because I can't remember how to get there and partly because it contains Meteor, a Wizard spell that deals earth-elemental damage to all enemies. 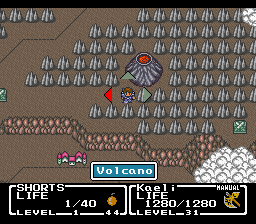 As the third Wizard spell, Meteor deals highly respectable damage, but the earth element saddled to it will never do you any favors. 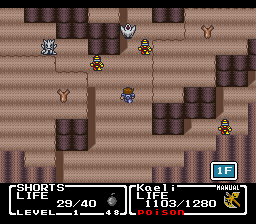 I'm not sure there's a single thing weak to earth in this game, and anything that flies resists it. 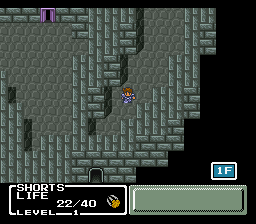 Speaking of "I can't remember how to get there," this whole dungeon is a bit more labyrinthine than is typical of this game, and I wind up going the wrong way as often as not. Oh, but see the face with the closed mouth? 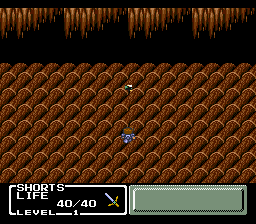 You stab the face with your sword to open the mouth. It's delightful. Between the worms and the trees, the game is giving you ample opportunity to give the Giant's Axe the workout of its life before it becomes practically obsolete. 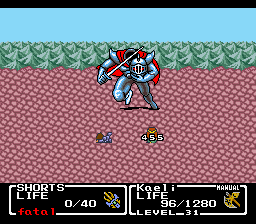 Even at level 1, SHORTS can fell an axe-weak enemy in one hit. 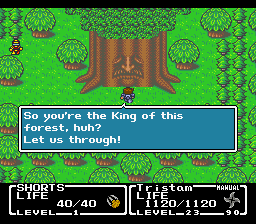 With no fanfare or pre-battle dialogue, here's the boss of the Giant Tree. Gidrah and the Skuldiers are all weak to Aero. 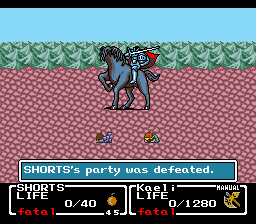 A spread cast of Aero isn't enough to kill off the Skuldiers, but even SHORTS can kill off a Skuldier with a focused Aero. With Aero dealing over 1500 damage a pop, the danger isn't Gidrah outpacing your damage but the petrification. 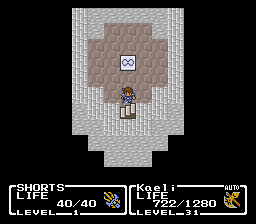 We've had to deal with it throughout this dungeon, but it's especially frustrating here, when Gidrah isn't consistently slower than Kaeli. 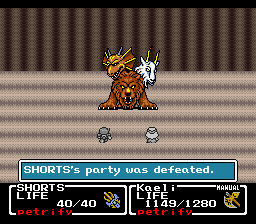 In this case, Gidrah petrified both characters without Kaeli getting an action in. 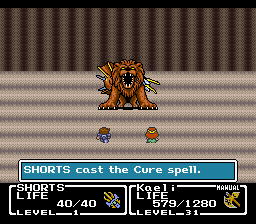 At three casts of White magic and one Aero, SHORTS doesn't last long before running out of steam, which is a shame, because his magic is actually quite potent in this fight. 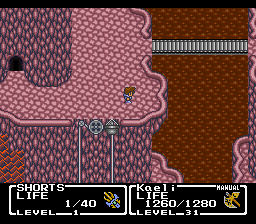 SHORTS's Aero is just under 1500 damage, and Cure lets Kaeli focus on damage. 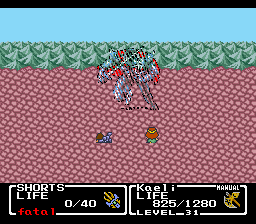 Gidrah's extra heads die off one by one as it nears defeat. This, too, is delightful. 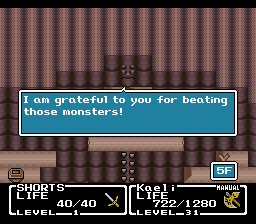 Gidrah is one of the harder bosses we've faced recently, but eventually, he stops petrifying Kaeli, and we score a win. When Gidrah is defeated, all of the common enemies also disappear from the Giant Tree. I guess we could go back for Meteor now if we had any Wizard spell charges. Grateful, the Giant Tree offers us a ride. Tristam has spent the past hour of his life engaged in creative deforestation -- a careful eye can see the message "GO ON KID!!" written in the background trees. There's this really cute animation of the Giant Tree walking across the overworld that we can't see thanks to the heavy cloud cover. This is as the designers intended, I'm sure. 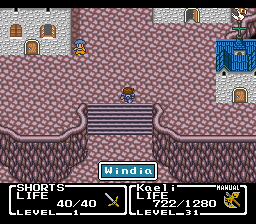 Our next stop is Windia, leading consumer of windvanes the world over and hey is that a chocobo? This is a real Final Fantasy game! 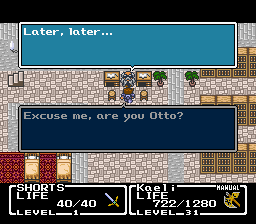 In the house with the chocobo wind vane, we find a man named Otto, or maybe a man who will be Otto later. The dialogue is unclear on this important point. But what is clear is that the man's daughter has become stranded in the tower of a Babylonian wind demon; it is less clear what she was doing there to begin with. She can't be saved until the winds stop blowing from Mount Gale. 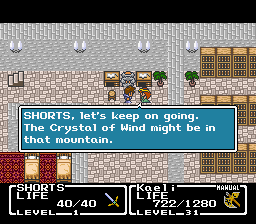 Kaeli, ever the hero, points out that we might find the Crystal of Wind might be there, never mind the girl. 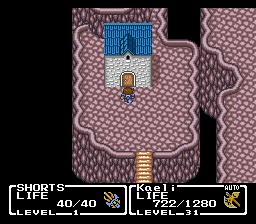 Before we go exploring any more dungeons, though, we have business in this house on the left side of town. 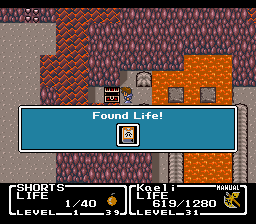 In the basement is this Mobius tile. Hey, we have a Mobius Crest! By the change in music, we can discern that we have teleported to Fireburg. To this guy's house in particular. We like this guy. He delivers one of the greatest lines in all of gaming. 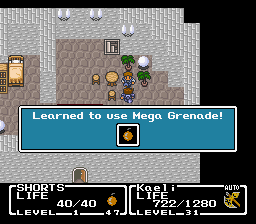 Also important: he gives us the third tier of explosive: the Mega Grenade. 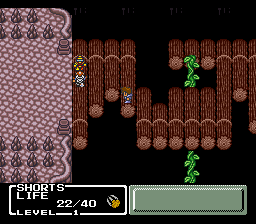 If we hadn't been in such a hurry to leave Fireburg, we could've acquired the Mega Grenade before the Giant Tree, but nah. We had better things to do. 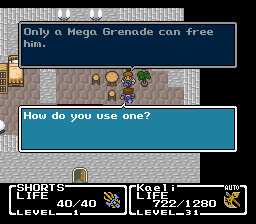 The Mega Grenade has an Attack Power of 162, which puts the Giant's Axe's 116 to shame. Again, we'll generally only want to use it against lone targets, but when we can arrange that, it'll do great things for us. Also, using a Mega Grenade on the map results in SHORTS chucking the thing across the full length of the screen at a very satisfying speed. The Mega Grenade is just fantastic. Back in Windia, a nice lady sells us her jewelry for a song. You'll definitely want to pick this up. 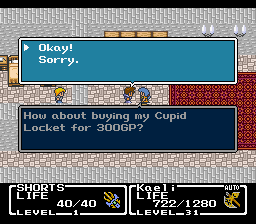 The Cupid Locket is an upgrade to our Magic Ring. 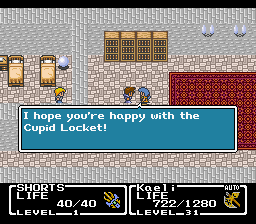 Relative to the Magic Ring, the Cupid Locket affords 3 extra Evasion as well as immunity to Blind and Confusion. Confusion is the major one: we'll start seeing more of that status very soon. Mount Gale is another playground for our Dragon Claw hookshot, as is very common now that we have that toy. 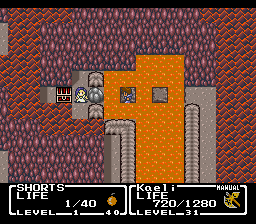 Very early in the dungeon, we can spy the boss, which is the egg with legs in the top right. 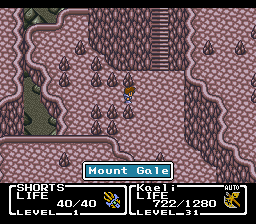 Nestled at the top of Mount Gale is the final helmet. Please also appreciate the nice skyline while we're here. 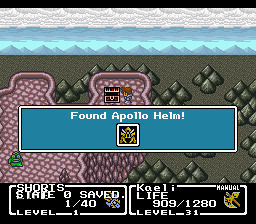 The Apollo Helm is a modest +10 Evasion and +11 Defense over the Steel Helm we picked up at the start of the game. It also offers fire resistance, but that's really not getting SHORTS through any attacks anytime soon. We catch up to leg-egg not long after. We accuse him of being the mastermind behind this plot, but he's just like, "Nah." He is offended, though, so we are thrust into battle against Dullahan and his backup Vampires. 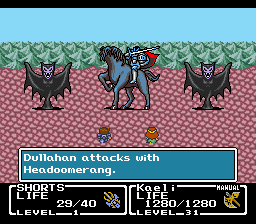 Dullahan has an attack called "Headoomerang." I can't emphasize this highly enough, because "Headoomerang" is the best name that anything has ever had. Also, Headoomerang deals over 300 damage to both heroes and really ruins our day. This is really bad because a solo Kaeli takes over 700 damage from it. I'll let it slide, but only because the attack is named "Headoomerang." Seriously. 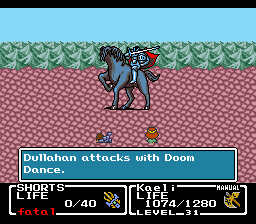 The other incredibly rude thing Dullahan can do is to instantly kill a hero with Doom Dance. It's not guaranteed to hit, but it does have pretty good accuracy. Not helping matters is Dullahan's lack of a weakness. Kaeli deals about 700 damage whether you use her axe or Aero. SHORTS does around 550 with a Mega Grenade or Aero. The difference between Aero and an attack is negligible, but you might land a critical hit on a regular attack. Then again, you might also miss. In the other corner, Dullahan has 14,000 HP. What's a legendary knight to do? 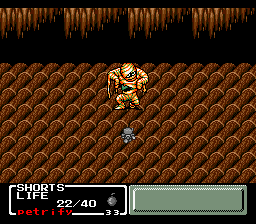 Well, for one thing, Dullahan is only immune to petrification and instant death. This is all well and good, but in practice, you are not going to paralyze or confuse Dullahan. It's just not happening. For one thing, SHORTS is rarely going to survive long enough to attack, and even then, he'd have to hit and get the Dragon Claw statuses to fire. What's that? You say there's... another way? This. 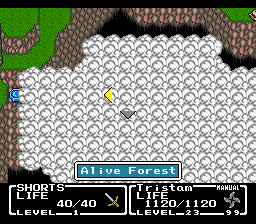 This is the best boss strategy in any game. Recall that casting Heal on an enemy will inflict a random status, chosen from Poison, Confusion, Sleep, Paralyze, and Petrify. 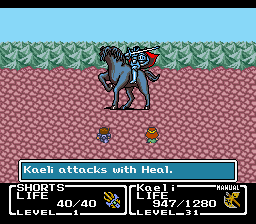 Kaeli can absolutely land one of the nastier statuses on Dullahan. 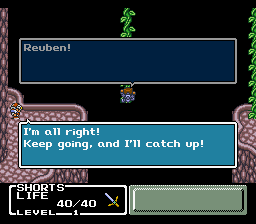 Sadly, everything gets a chance to recover from statuses at the end of each round, and Dullahan will consistently recover from Confusion, Sleep, and Paralyze every turn. 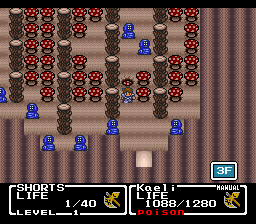 Even Poison doesn't stick around long enough to make it worthwhile -- it's only dealing 99 damage per round anyway. It's back to the drawing board, then, and that's where I called it for the night, so naturally Windows decided to update. 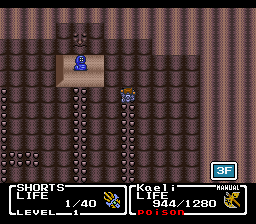 Not to worry: I saved state before the boss fight. Hang on. 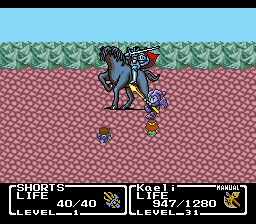 This isn't Dullahan. Our detour takes us to the Volcano, guarded by Medusa. Medusa is annoying in her own ways. 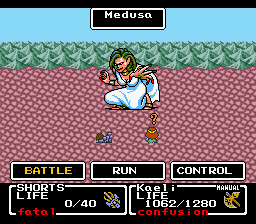 The strategy for Medusa is for SHORTS to queue up Heal in case Kaeli gets confused or petrified. 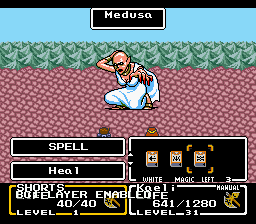 Medusa inflicts light damage when she causes those statuses, though, so SHORTS is not long for this fight. 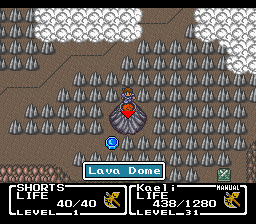 Medusa isn't a free battle like the boss of the Mines, but she yields much more quickly than some other bosses we've been fighting, giving us access to the Lava Dome. We fight a Medusa palette-swap to get Life for SHORTS. This completes SHORTS's library. 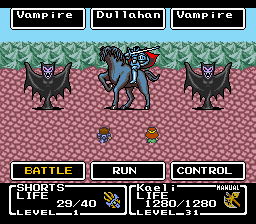 Let's go back to Dullahan. I had it in my head that this would help. Let's talk about the ways this fight goes wrong. First, Doom Dance. Just... Doom Dance. 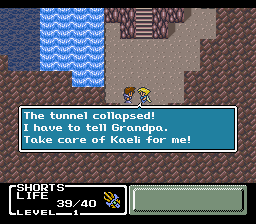 Instant death ruins Kaeli's day. 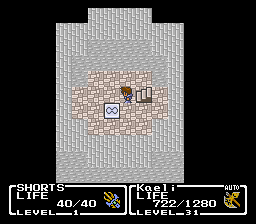 There are two counterplays to this: one, you can keep SHORTS alive and have him spend every turn targeting Kaeli with Life just in case. 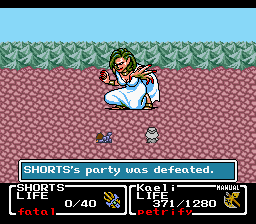 This has the advantage of keeping Kaeli topped off, but you spend most of your turns reviving SHORTS, and you spend a decent chunk of the remainder restoring SHORTS's limited spell charges. The second counterplay is called "hope Doom Dance doesn't kill Kaeli." Second, critical hits. Dullahan has two attacks that can crit: Thunder Beam does a paltry 500 with a crit, but Rapier does a much less reasonable 1000. 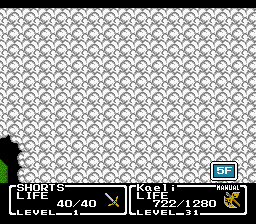 If Kaeli isn't very nearly at full health, a critical Rapier is death. Finally, turn order. Kaeli usually goes first, but sometimes, Dullahan is just a go-getter. If he goes first . In practice, turn order is rarely what does us in, but it can, and when it does, it's really galling. "How does the Dullahan fight go when you aren't level 1?" you ask. 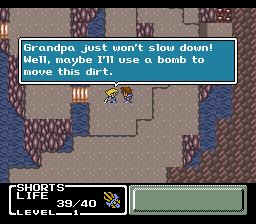 Well, in that case, you cast Meteor, and things die. Even then, Doom Dance is an instant kill on either hero, so there's always the slim chance that you just unavoidably die. It's not nearly as much of a hassle in that case, because your odds of winning are generally pretty good. For us? 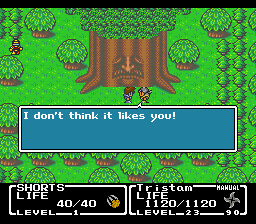 Dullahan is a matter of retrying until Dullahan decides to be really nice. 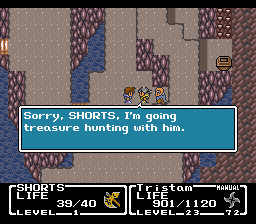 For all of the trouble we went through to get Life, it's just not worth keeping SHORTS alive. I think we'd improve our odds a bit by playing conservatively, but it's much, much slower to play that way. Quicker to throw myself against Dullahan a hundred times and get lucky eventually. How many is "a few", exactly? And would you say Dullahan has been the hardest boss so far? 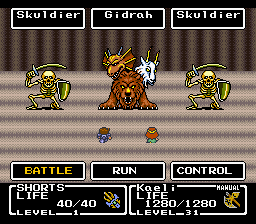 When I first played this game I thought "Skuldier" was a really awesome name. 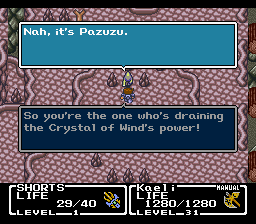 Only years later (while playing Dawn of Souls) did I realize what the name actually was and it became vastly less awesome. Last edited by Torzelbaum; 04-23-2018 at 09:38 PM.